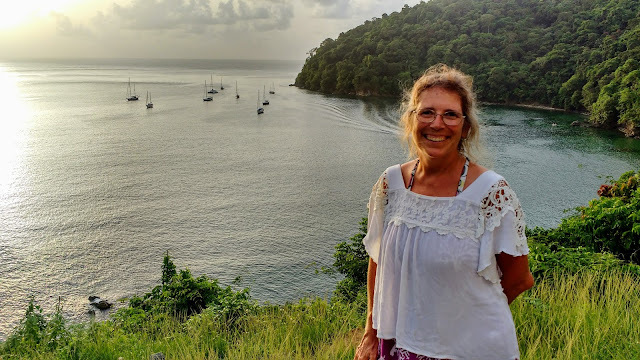 Tucked into the NE corner of Tobago is a quiet little cove called Pirate's Bay. 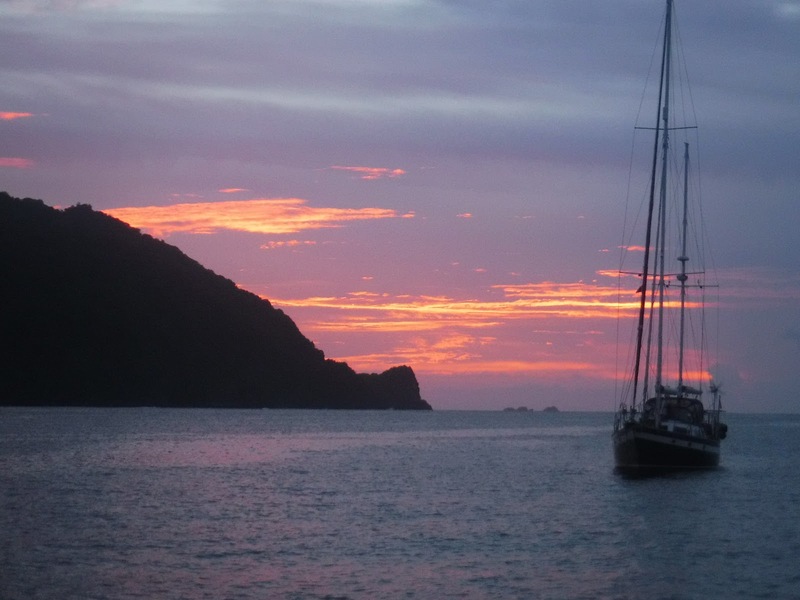 The town is Charlotteville, a sleepy little fishing village. There are a dozen boats here. Three or four of them are French, one is from Switzerland, another from Brazil, one from Russia (first one we have seen, hailing port Moscow, a wee bit landlocked), one from the UK, one from Canada, a few unknowns and one US (Rhapsody). Three blue hulls, two red hulls , one yellow hull and the rest are white. Three of the boats have kids, all seemingly pre-teen and all of them are long term cruisers (not charters). Rhapsody is one of those boats! The winds swirl around our little cove, swooping down from the hills beside us. When the winds come up all the boats point in the same direction, which could be any direction on any given day. Sometimes we point in to town, sometimes out to sea. When the winds let up the boats relax on their anchor chains, each one pointing in a different direction. As the winds pick up again the boats will slowly begin aligning themselves again, two or three at a time, usually beginning with the boats closest to shore, the others following suit soon. Looking out from Pirate's Bay. We are close to shore, jungle on one side and beach on the other. The beach fills up on the weekends (by fill up I mean maybe a dozen people) but is very quiet otherwise. The jungle is lush and green. There are some rock cliff faces with vines trailing down them like a beaded curtain. Purple flowering trees peek out through the green, providing contrast. The jungle is usually quiet during the day, with occasional outbursts, but at dawn and dusk is when it comes alive. 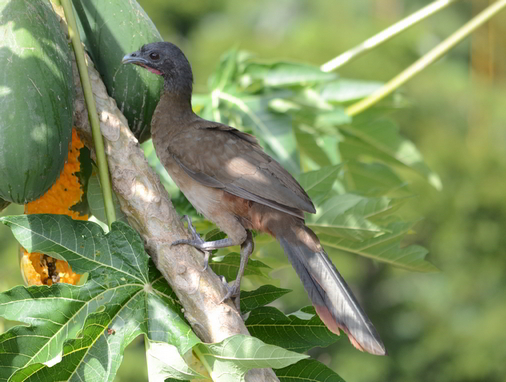 The Cocorico is the national bird of Tobago. It is pheasant sized and not found in Trinidad. Despite being the national bird, it is considered a pest by the farmers as it likes to eat the crops. They are very noisy and fill the jungle with their raucous sounds. It is always difficult to describe bird sounds in words, and this is no exception. They are loud and numerous and sound like a cross between a turkey, a monkey and a parrot. Another reason they are not so popular with the farmers!